This is a very fine work. A teacher in a Catholic school is not just a teacher. He or she is a witness to gospel values and attitudes within a culture that often has a very different drift. In these pages, seasoned educator Jill Gowdie reflects creatively and profoundly on how teachers can open themselves up to formation that inspires them to answer the call to become ‘missionary disciples’. These are reflections tailored to fit the Australian Catholic school context, but they will be helpful and inspiring for Catholic school teachers everywhere. 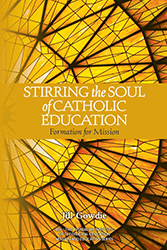 In this book, we see the rare distillation of experience, scholarship and insight across diverse disciplines in order to re-imagine a fresh and incisive approach to what formation may mean in the Catholic educator in today’s schools. Jill’s style is inviting and comprehensive, reflecting a broad-ranging mind and a passionate heart that is visionary, passionate and deeply authentic. After many years of stirring the souls of Catholic educators, Jill Gowdie gathers her wisdom ‘from the heat of the day’ into this very fine text. For Catholic education, no one is more insightful on the vital exchange between faith and culture than Jill Gowdie.